Congrats dude! That will be a ton of fun in the canyons around you. Damn, you don't hold back do you?! This is what happens when he starts drinking before lunch. Thanks man! Looking forward to sorting some things out and going up on an off Friday. At least I know I won't have any issues with being pulled over for off-throttle noises. Congrats on the purchase, OP. Can never escape the Porsche allure. That's simply how Porsche owners park. Awesome blossom extra awesome. Congrats! Congrats, and despite not knowing you personally, could see something from a mile away. The appeal of a Cayman is hard to pass on. Getting the base 987.2 has many appeals, including a 9A1 without direct injection. All the benefits of the 9A1 without the carbon buildup issue. Very nice! I had a one owner 80k mile base 987.2 lined up for $17k before buying the 993, was ready to fly out and grab it then found the 993 and backed out of the deal. Now that I realize how much of a steal that would have been, I keep kicking myself for not buying both . 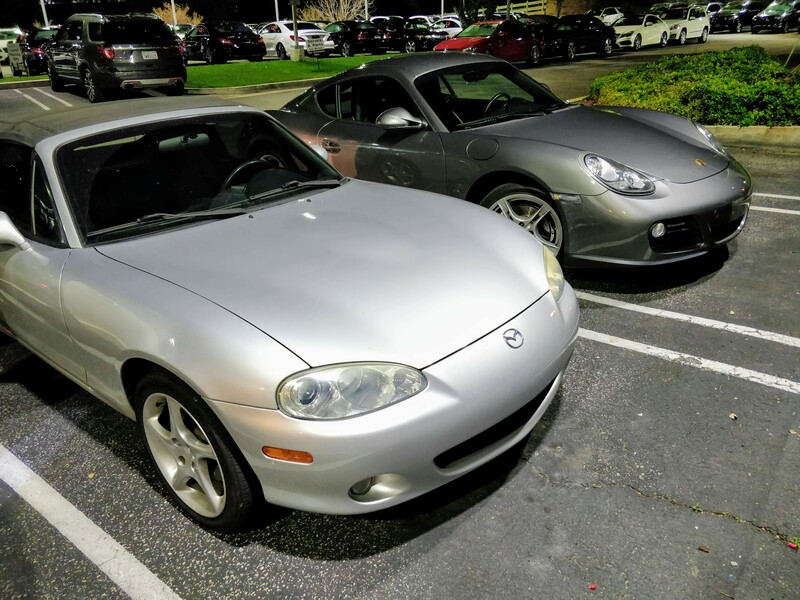 I went back the next day with a friend to pick up the Miata. Interesting seeing them next to each other. This and the similarly optioned 987.2 Cayman on BaT are making it really hard to ignore these! If you don't mind sharing, about what did the car cost? 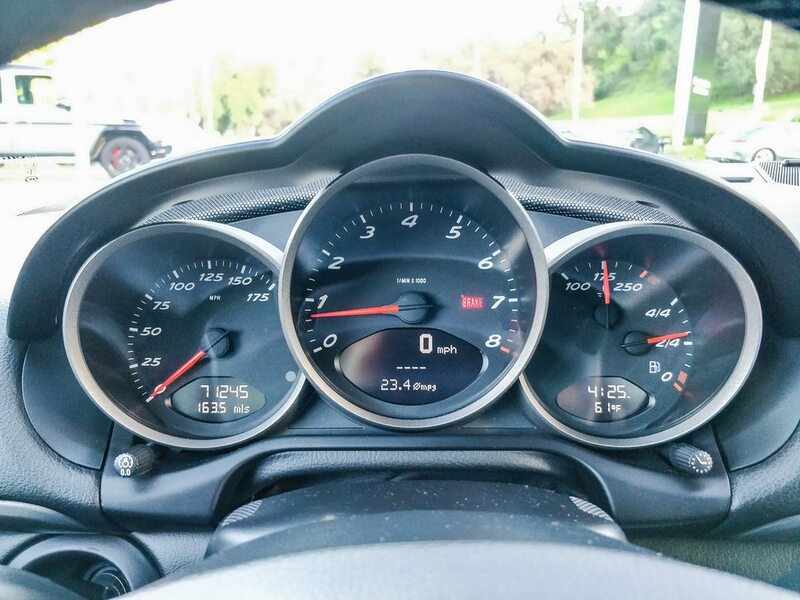 I recently drove a base Cayman. They’re so nicely balanced and sweet, perfect example of how you don’t need big hp to enjoy a car when everything works so well. Congrats! Yeah, these are definitely in the sweet spot in terms of looks, power, and reliability. If you don't buy one of these, you can spend that cash on a base Malibu instead. Time to buff the Miata headlights. This is the spec of cayman that interested me most! 987.2 base gets the 6MT compared to the 987.1 5MT. I had a 2008 base cayman, then a 2014 cayman s and now a 2014 base boxster. My question is do you get the nice engines and belts sound out of the 2009 that you would from the 2008 and earlier caymans? Before I got the boxster, i had 2009 and up in my sights. Just couldn't find one and when I did it was in the $30s. I also think the base cars are more fun because you can keep your foot in the gas more. well, nice pick-up OP, congrats hope to see it/you at the next TCL meet-n-drive! Congrats! I love the '09 update to the Boxster and Cayman. The engines weren't only brand new, they got a good amount of power and torque for the base models with the displacement bump to 2.9L. As good & better than a 986S. It's been a long time since I drove a 986 but there's more engine noises compared to the 981, however I had the sport exhaust so that pretty much overwhelmed everything else. I removed the foam carpet above the engine cover a couple days ago and now the engine and induction noises really come through! It's a lot more engaging so I may do the clear engine cover mod later on. I haven't pushed it too hard yet but it's arguably more raw than a 981 and going WOT is possible for a longer period. I love how the max torque is flat from 4500-6000 RPMs. Every time I've picked up a car from dealer, they do 2 things: wash it and fill up the gas tank. Seems silly to try to save $20 on their part. What made you start looking at Caymans? I remember your Z4... didn't your brakes overheat on Latigo? I need to sit inside it to see how the seats feel. The ones in the Z3 were really stiff with no support. Yeah, but would your finance guy say "awesome credit score, bro!" and proceed to tell me how "Porsche tires" are really expensive?! Hmmm? I wanted to ask him what's a "Porsche tire," then let him know the Ventus V12s that are on the car aren't N-rated. But with 8/32nd in the front and 5/32nd in the rear, I got some time left. my brakes got worked hard & very hot but never overheated, per se... my seats are fine, no complaints in 7 years & 70k+miles as my daily driver; dunno about the Z3 seats specifically, but those interiors just seem much, much older (and hence, more "classic") than the Z4 imo.